AUX_MU_IO_REG : used to write data (1 byte) to and read data (1 byte) from the RX/TX FIFO (8 byte buffer). 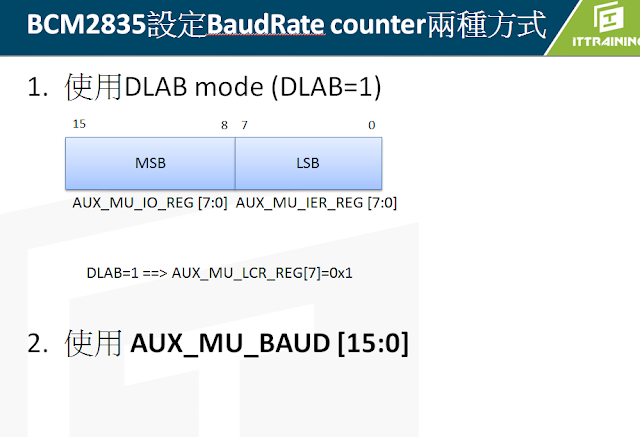 AUX_MU_BAUD : set the 16-bit wide baudrate counter. 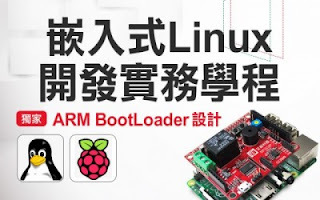 AUX_MU_STAT_REG: Some information about the internal status of the miniUART. AUXENB : If the enable bits are clear you will have no access to a peripheral. You can not even read or write the registers! GPIO pins should be set up first the before enabling the UART. So when it is enabled any data at the inputs will immediately be received . If the UART1_RX line is low (because the GPIO pins have not been set-up yet) that will be seen as a start bit and the UART will start receiving 0x00-characters. Figure shows a common method used by a UART receiver to synchronize itself to a received frame. The receive UART uses a clock that is 16 times the data rate. A new frame is recognized by the falling edge at the beginning of the active-low START bit. This occurs when the signal changes from the active-high STOP bit or bus idle condition. The receive UART resets its counters on this falling edge, expects the mid-START bit to occur after 8 clock cycles, and anticipates the midpoint of each subsequent bit to appear every 16 clock cycles thereafter. The START bit is typically sampled at the middle of bit time to check that the level is still low and ensure that the detected falling edge was a START bit, not a noise spike. Another improvement is to sample the START bit three times (clock counts 7, 8, and 9, out of 16) instead of sampling it only at the midbit position (clock count 8 out of 16).